Leslie Model 145 | MOSweb Online! This model uses a 147 amplifier and is essentially a short 147. 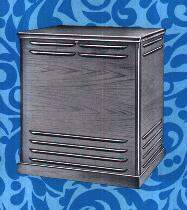 This cabinet is considered to be “Universal” because it can be attached to almost any monaural organ with the appropriate connector kit. Because of it’s cabinet dimensions it has slightly less bass punch then a full sized cabinet like the 47 or 147.